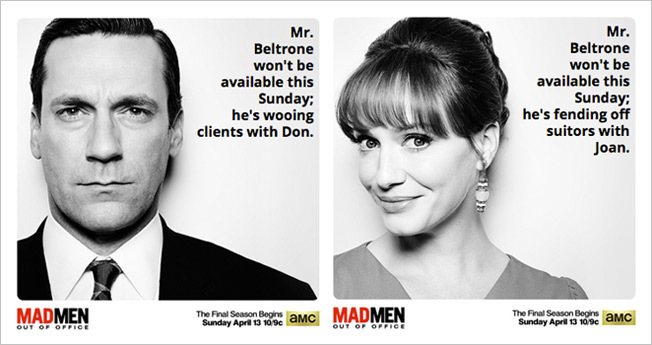 If you can't wait for Mad Men to return for part one of its seventh and final season this Sunday, and you're itching to declare your intention to watch it to all your social media friends, AMC would like to offer you a special opportunity to advertise on its behalf by customizing a picture of Don Draper so your name appears next to his face. You can choose one of seven other characters, too. It's a fun tool for die-hards, and a smart way to drive the natural symbiosis between TV and social media. Dubbing it "Mad Men Out of Office" seems a bit of a misnomer (as much as posting to Facebook may feel like clocking in to some). If you were going to be in the office on a Sunday night, you should obviously quit and watch Mad Men. Unless you work in advertising, in which case, of course, you probably are in the office on a Sunday night, and you won't be watching Mad Men, or having much use for AMC's widget. You can still drown your woes in Canadian Club, though—and catch up on the first six seasons in two minutes, to remember what you'll be missing.